“This is a bit more than just a race report. It’s more of a story about a big week long adventure to Falesia in the Algarve Portugal. I think in my case, it was a step into the unknown too. It certainly proved to be an experience like no other for me, but absolutely fantastic. Lots of eating nice food, as much drinking as you want, and being able to talk running, and do it for hours on end. This is an annual event which has been taking place for around 30 years. It all started with a few people coming out on a training camp run by 2:09 Events, the company set up by the athlete Mike Gratton in the 80’s. Mike won the London Marathon in 1983 with a time of 2hrs 09mins, he is also a Commonwealth Games medal holder. This company with Mike Gratton, still runs the training camp here, happily taking lots of cash from aspiring young athletes. A few people got together after that to organise their own annual ‘training camp’ in Falesia, FB Tours was born. This breakaway group had a more laid back interpretation of the words ‘training camp’, maybe less structured than the 2.09 Events one. Your experience ranges between having a bit of a workout to I’m just having a laid back holiday pretty much covers it. So there was a training plan with two runs a day on it together with three races, and… um some social activities, the Neptuno Bar featuring as the meeting point, and the grand finale the presentation night, and fancy dress competition. The training plan was a bit indicative of what might happen, it often did, but I soon learnt not to trust it implicitly! Debbie & Geoff Reid have been coming here for some time and extended the invitation to Helsby Running Club this year. This year I came for the first time, and Sue Buck who has been before. In total there were around 56 people whose ages ranged from 8 months to 70+ participating. Our event organiser/coordinator is Fred Aird from Deestriders Running club. Spectrum Striders were quite well represented, and a few from various other clubs in the North West. Many of the participants I knew, or recognised from races. There was a choice of places to stay, ranging from the incredibly luxurious Epic Sana, where Debbie & Geoff stayed with its private access to the beach and gated driveway to more modest apartments nearby. They kindly allowed us in for a brief viewing of their private steps and a walk through the hotel and grounds! Sue & I independently both chose the Victoria Sport Hotel with very spacious apartments with kitchens and a balcony. This still had a 4* rating I liked it because it had a running track guests could use. The 2.09 training camp also stayed at the Victoria. I had the breakfast option which was very good too. The weather was glorious all week, sunny around 20C, but a bit breezy at times. Debbie did say the weather was the best ever, sometimes there isn’t so much sun, but it’s always warmer than the UK. There were plenty of other activities other than running to enjoy in this beautiful area, with its stunning beaches and crumbling cliff’s, eaten away by erosion and terrific views. We got to run on the beach, over the cliffs, along tracks paths, through the nature reserve with Turtles and other wild life. The morning runs were generally around 5-6miles but it was possible to do more. Cycling is a good way to explore the wider area. Sue and I both hired bikes and went off on rides, to the nearby areas of Vilamoura, Quarteria, Loula and Paderne. Navigation could be little challenging at times especially on the minor roads, but on the whole was a safe experience. Just one moment we hesitated and avoided turning onto a motorway! A sketch map given to us by another cyclist/runner was very useful. I think if I’m honest the cycling was definitely a highlight for me, being able to explore quite a lot of interesting places, eat ice-cream and find cafes, one where they didn’t speak any English. I had to ask Mike Gratton to move out of the way so we could pass him on our bikes! That’s the first time I’ve overtaken a London Marathon winner! Mustn’t forget the Races; race 1 was the Falesia 5k on Tuesday at 10am. I’ve never done a race on a Tuesday morning at 10am, but it beats working. It cost 4 Euros to enter, was 3 laps on the road and went past the Victoria Hotel. But the course wasn’t flat, and it was quite hot. Debbie & I were the only Helsby runners, Sue was marshalling outside the Victoria. I decided to run with Debbie trusting her judgement on how to pace this race in the heat, amazingly we stayed together for the whole race, and it made life easier for the photographers! On the approach to the finish Debbie got slightly ahead, I closed the gap and just got past her to the finish by 1sec. This was an amazingly close race and to all intents a draw between us. The results aren’t yet on Run Britain. Race 2 was the Cross Country Relay team race, on the course under the trees next to the Victoria Hotel. There is plenty of loose sand tree roots and it goes uphill too. 3 Runners do two 1k laps and one 2k lap. Debbie & I were chosen to be in the same team with one other runner. Our team was not first or last but finished somewhere in the middle. Race 3 was the Cross Country Handicap. 3 laps of the course with staggered start times based on power of 10 best 5k times. This gave Debbie a 15 sec start ahead of me, Sue getting a bit more time ahead of us both. Running earlier in the day, cycling and the heat took its toll on me, I couldn’t close that 15 sec gap on Debbie, by the third lap the gap got even bigger. The race was won by one of the slower runners who started well before most of us did. And now over to our newly crowned Borders League champion! “It was a lovely cool morning in hope and the excitement of another boarders race was in the air. Despite it being Mother’s Day, I was over the moon with a strong number of the green army rolling up, especially for the ladies team! As always I had my lucky charm with me and the parents cheering the green army on! With the start of the race being delayed, this wasn’t ideal especially for my pre race nerves! However I knew that by winning this race I would secure my women’s champion title so I couldn’t help but turn the nerves into excitement. I wanted to win the race but try and race my strongest to show I was deserving of the title. As we queued up on the start like sardines, The race was finally underway. A quick first mile, I began to panic that I may have gone off to fast. I steadied myself down and managed to keep a good pace. I knew that as o passed the mile 2 mark there was a long drag of a hill approaching, although being from helsby I knew this wouldn’t phase the green army! As I approached the bottom of the hill the sun came out and I managed to start picking off the men one by one. I kept pushing through the rest of the hill and pushed myself back down and along the undulating course. As we approached mile 4 I could see Fitzy in my sights, I pushed as much as I could to keep up with him and his 4%’s. As the finish line was in sight, a little ‘go on hannah’ came from Fitzy and I pushed as much as I could until I crossed the finish line. As I finished 2 green army vests came racing past me and just pipping me to the finish to make it a 24th, 25th and 26th place finish (how’s that for team work!). Overall for me it was an amazing course, the most controlled, enjoyable borders race this season and possibly my favourite 5 mile race. All the hard work and training/ speed sessions especially at the park with June and John have definitely been paying off! What made the day even better was my ladies championship sealed with a race to spare and the helsby ladies team finishing 1st on the day and 2nd on the overall standings. Amazing Hannah, the first Helsby Borders winner for a very long time and well deserved too! Be sure to congratulate Hannah on her achievement all! We had some other fantastic running from the troops too. Congratulations to Danny Ryder on a superb run to power through the field to take the chequered flag for first Helsby runner home in 28:29 and a new PB, just pipping Neil Finegan and Hannah who were seconds behind and who also got big PBs. Brilliant running! The vets were also flying with Colin Bishop (MV55), Paul Frodsham (MV60), Alison Halsall (FV45) and Debbie Read (FV60) all winning their respective age categorys. Great running all! Let’s get a massive turn out for the last borders and end the season in style, the final one is on Weds 24th April in Prestatyn. Start time is 7.30pm, put it in your diary folks! Please find the consolidated results from last Saturday’s parkruns, well done to everyone who took part. That’s all this week folks, thanks again for the reports and please keep sending them in, it makes our job easier each week as well as giving the blog more variety. The Helsby RC inbox is helsby-race-reports@outlook.com. Thank you to everyone who turned up for the 10k TT on Wednesday evening, nine of you in total. Congratulations to Ed Halliwell who stormed around in 41:31 to take the chequered flag and Graham Lloyd was our only runner in the 6k so therefore gets the kudos of a win! Also a huge big thank you to the 10k TT team on the night who were Louise Spruce (results), Jackie Keasley and Tracy Woods (timing and tags) and John Whitehead (marshalling). We have finished our winter program now but we will be hosting a few 10k TT events over the summer, details will be announced soon! A busy week of racing last week and some superb reports in the inbox so let’s get started! This weekend it’s the Helsby Community Sports Club 10th annual beer festival. Please support if you can. Thanks to Juni & John who have kindly stepped in to organise & lead our Monday night training sessions whilst Joe & Mario are unavailable. Last Monday we tried using Helsbys new running track/path in the park by the Scout Hut on Lower Robin Hoods Lane. Feedback was very good & with it being a tarmacked track it’s a great option when Castle Park is wet/gloopy. The plan is to try a few new sessions & places/routes for the remainder of our Winter Mondays. Our Summer sessions at the High School will start after Easter. Each weekend they will post on Facebook Helsby Running Club page the session plan for each Monday & where. If you are not on Facebook this is a problem. As a temporary measure till we work out what’s the best way to spread the word each week to all. Juni can email you the session details each weekend if you let her know your email address. Thanks & hope to see you on a Monday soon. I’m running the London Marathon this year for Team YHA. Today I’ve set up my just giving page which gives the full story of why I’m running a marathon once again; who for & why! It really all means a lot to me. It’s a great cause, changing young lives forever through outdoor adventure. Race day is April 28th, so training is well underway. Nearer race day, after training on a Wed, I plan on showing some heartening videos of the rewards & reactions of young people experiencing a YHA adventure break for the first time. With free chips too of cause! Please support, if you can, by donating to this great cause. Although it’s early days yet, as I prefer to get rewarded on completion, I’ll send out a reminder after race day too! Season 3 of the road runners v’s the fell crew is nearly here. The 2 races shall be Borders League Race 6 in Buckley on Sunday 31st March, and the Fell race will be at Dinas Bran on Weds 8th May 7.15pm. For those who have not heard of this challenge before, we’ve done it for the past 2 years, and it’s to create a bit of banter between us road runners and the Felsby crew. Felsby have won it for the past 2 years, actually Helsby have never won it, but I reckon this year will be different. All you need to do is choose a team you want to run for, so for example I would run for the road running Helsby team, and Chris Baynham-Hughes would run for Felsby. If however, you clearly are a road runner like Adam Gordon, but choose to bat for Felsby, I may unfriend you on Facebook. Points are given for just turning up, which is why it’s important to get great numbers to both of these races, and points are also given for 1st, 2nd, 3rd and so on. Every point helps. Email me fitzpatrick_chris@hotmail.com or message me on Facebook, and i’ll add you to the teams. You can also turn up on the day and I’ll allocate you a team. You don’t have to come to both races, but it would be better for your team if you did, and remember, it’s a bit of fun, and the main aim is to get more Fell runners to the road races and vice versa, us roadies to the Fells. I entered this race as prep for Edinburgh Marathon last year. However, it coincided with the Beast from the East and was cancelled. The organisers kindly transferred my entry to this year and so I went along on Saturday. In previous years it has been a 20 mile race, but the metric system has arrived in Wales and it is now a 30K. Organised by Rhayader Athletic Club it is a small local race based around the leisure centre in the middle of town. This years record entry saw 540 of us complete the course. Rhayader is in Powys and famed for its Red Kite population and they were out in force to watch the start. I had planned a marathon paced tempo run, but fortunately looked at the route profile the night before. The first 6 miles are uphill with 1200 feet of climb and a consistent pace was not realistic. Storm Freya also arrived making any consistent pacing a challenge with 40mph winds and driving rain. At times it felt like a challenge to stay on my feet never mind stay on pace. The race starts just outside the town centre and then passes down the high street before heading out into the Elan Valley. This was a new location to me and a real revelation. The valley is rugged and beautiful, possibly the most impressive countryside I have ever run a race through. The valley was flooded in the 1920s and provides the main water supply to Birmingham. It has a series of huge dams linking three reservoirs. With the wind, however, at times it was a challenge to breath…my cheeks acting like a giant wind break and the rain stinging it was hitting so hard. At the worst point I ran with some lads from Todmorden taking it in turns to lead and break the wind. Fortunately, the last four miles were downhill with the wind on your back…a fantastic way to end a race of this length. I finished 58th in 2:21 – just 6 second off my intended tempo which I was pretty happy with. The organisation was great…really low key but friendly and efficient. The tea and bara brith at the finish topped off a great experience. Its a race I’d like to do again…but hopefully with a little less weather. The 2nd of the Clwydian Mid Week Series (a to a Clwydian summit and back). This one was Foel Fenlli, Moel Famau’s neighbour and a 3.5 mile loop. It started with a long grassy descent from the car park on a narrow path to add a bit more ascending to the evening. I quite like the downs, and after being surprised with an ok finish place last time, I thought I’d be brave and put myself at the front. A little out of place, but it meant I’d avoid having to check my stride if anyone was taking it easier. It worked out well as I managed to make a place and get to the bottom in 3rd(!). I knew that’d be my high point though so as we started to climb the long path that wrapped around the back of the hill, I just tried to keep perspective (and count) as the quicker runners came past. The weather couldn’t have been more different to round one. That was driving rain and 5m visibility, this was really mild and a sky full of stars! 7th, 8th, 9th (and a dog). I lost count then but it didn’t get too much worse and a glance back as we reached the top showed a bit of a gap to the head torches behind so I was hopeful to better my 16th place from round one. Scan of the wrist band as you go over the top and all the way down the other side. The field had spread a bit so there weren’t many runners in reach on the descent but I managed to regain a couple of the places I’d lost. The route drops down past the finish, along a straight fire track that gave me a glimpse of the next two runners in the distance. A u-turn at the bottom onto a path to come back up the 500metres to the finish. Each site of them showed them a fraction closer… maybe… but that’s where they stayed to the finish. Just close enough to give me hope, but all I actually got was a pretty painful last stretch trying to catch them! That, or good training, depending on how far after the effort you’re thinking about it. A few fewer runners this time but I managed that higher finish – 13/39. If it carries on like this, by Christmas I could be on the podium out of a field of 4. Another fantastic turn out from the Green Army at the Borders on Sunday, a big thank you to everyone who turned up to support the club on a cold and miserable day at Birkenhead Park. The course is 4 full laps of the park with a slight detour around the lake and then the long slog up to the start/finish. Fitzy and Hannah lead the charge for the Helsby contingent with Fitzy having a storming run to take 12th place overall and first home for the club and Hannah showing her class once again to take the overall win by quite a big margin! Great stuff you two! 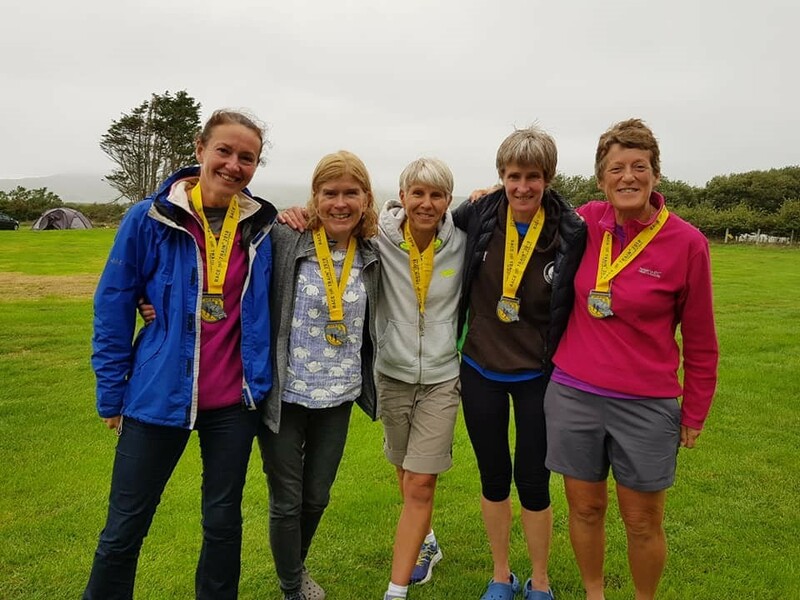 We had an array of age category wins and podiums with Colin Bishop, Alison Halsall, Laura Baynham Hughes and Debbie Read all coming in first and Jackie was second in her age group! Helsby really does have some super vets!! Well done to everyone else who ran, we have a great strength in depth in our squad and it really paid off on the day and cemented the men’s team in 4th position in the league with the ladies in 3rd. Don’t forget the penultimate race is on 31st March, this is a new race in Caergwrle hosted by Buckley RC, put it into your calendar folks! I’m sure Fitzy will be rallying the troops nearer the time. That’s all this week, thanks again for all the reports, please keep sending them in, the helsby inbox is helsby-race-reports@outlook.com. The men finished 4th on the day and the ladies 3rd. Due to a couple of clubs not providing full teams the men have now moved out of the relegation zone and have cemented a strong position in 5th place overall and the ladies are now 3rd. Well done everyone and see you in January for the next one, I’m sure Fitzy will be rallying the troops nearer the time. Please keep sending in those race reports, the Helsby inbox is helsby-race-reports@outlook.com . The blog will be a very bleak place without them! Welcome to this weeks blog, we had three brilliant reports in the inbox this week, thank you so much to those who contributed, it makes our job so much easier. Before we get to the racing news please find a message below from Janet with the confirmed dates for this seasons NWSL cross country champs. For new members or those who have not done these yet, this is a great series of races which are free to enter, just turn up in your club vest. Each race is followed by a social get together with tea and sandwiches. Liverpool and District Cross Country Races are already included in Tim Palmer’s amazing race calendar. Thursday evening saw several of the Green Army head over Chirk for 3 leg multi-terrain relay 2miles each. Helsby put up 4 teams 2 Male and 2 Female. Greenwithenvy …Ian, Davyd and Peter home in 12th place. The course had a downhill start with few climbs and downhill finish over multi-terrain. The relay also involved us carrying a baton which included our chip 😲 wish I could spell that the way Michael Johnson pronounces it. 😄😄😄 Fabulous scenery. Well worth putting in the diary for next year. I’d last done this race in 2015 when a few of camped to celebrate Jane’s birthday. I can’t remember whose idea it was to camp and run it again, but as I’d particularly enjoyed the event party afterwards, I decided to join in the fun and camp for the weekend. Jackie and I had a relaxing morning before setting off to cheer Janet on as she ran the 10k. Janet looked strong and happy as she came past us and beat the train!! Well done Janet! The 14km is very much a race of 2 halves. The first 7 miles are on tarmac (first mile), followed by good farm tracks and footpaths, so it’s possible to run quite hard. The route then turns round and follows a muddy single track on the side of a hill, through some forest, the ‘bog of doom’ and a short traverse before rejoining the route from the 1st half for about 3.5 miles back to Tywyn. The race is very well-organized, with water stations at a lot of the farms, well-marshaled, loads of support and has the feel of a big road race with a lot of cheering and high-fiving in the town. One for the diary for next year, although as lovely as the 14 miler is, the 10k covers the best part of the course! 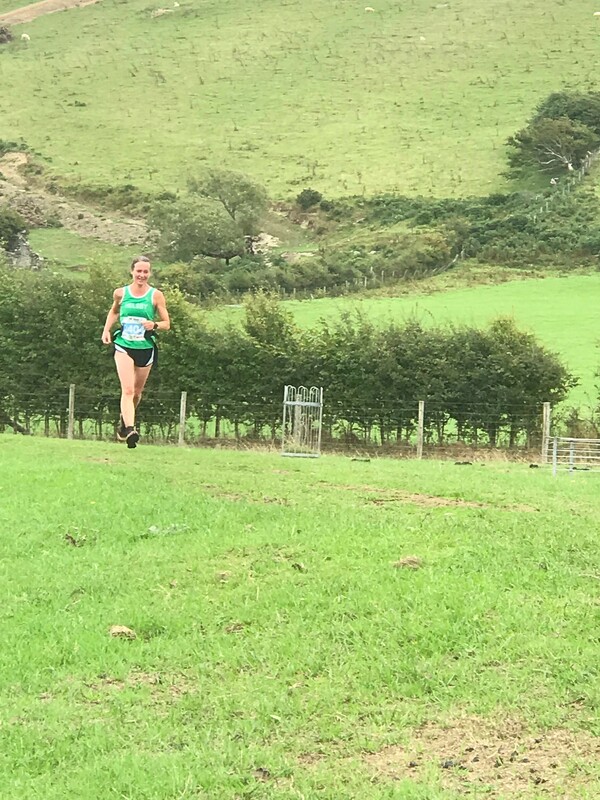 I’ve not had a race go quite this well in a very long time and to be honest, I was not expecting it either as I was convinced that I wasn’t very fit for various reasons. I was worrying during the first half that I’d gone out a bit quick, but felt OK, so kept trying to ignore that nagging doubt. Just after the turn round, something weird happened and the endorphins really kicked in and I felt great – I clearly need a 7 mile warm up!! This feeling kept with me for the rest of the race!!! Was this down to the half a malt loaf I’d eaten pre-race??? Imagine my surprise at the after show party when I discovered I was first FV50!!! Jackie said she’d never seen me move so fast when I ran up to get my prize!!! Well done to all the Helsby vests that ran. Richard Hankins was first home for the men and narrowly missed beating the train and Chris was first home for the women. The Ellesmere Port 5K was the 9th of our 12 road counters for this year. A local club race around Capenhurst it has been on the calendar for some years. Last year number collection was an issue and the race started late, but the use of i-pad check in removed those issues. The race starts on the main road which isn’t closed before the runners line up and this makes the event chaotic at this stage. Once off it is a largely flat single loop finishing at Urenco, but very congensted for the first 500 metres if the start line melee leaves you out of place. Ten Helsby runners turned out, one of the best turn outs for a road event this year. The weather was fine with a bit of a headwind but times were not stunning with only one runner below 16 minutes. Chris Fitz led the team home in 20th place at 17:41. Notable performances also from Ian and Peter and a new PB for Rachael. Overall, a convenient local race. But, never seems that fast and would definitely benefit from more loos! 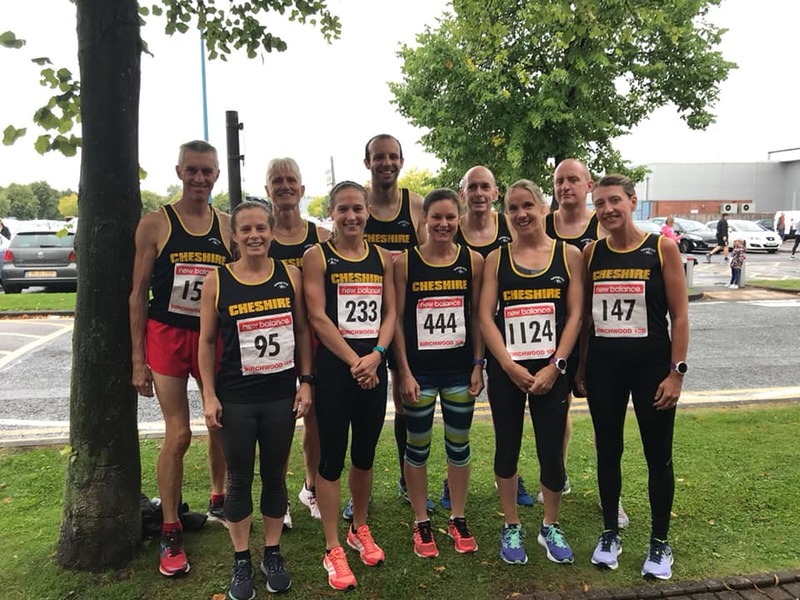 And last (but by no means least 😉 please find a report from Fitzy below for the Birchwood 10k, his first outing in a Cheshire vest and well deserved! Over to Fitzy…. A handful of the green army headed over to the Birchwood 10k on a wet but warm Sunday morning. I had found out 3 weeks ago that this race was an Inter Counties race, and I had been selected for the mighty Cheshire. I think I had been picked maybe due to a few people being away, but was still over the moon to have been selected. Maybe they looked at my spring running times and hadn’t taken into account that all I have done for the past 3 months is eat and drink over our glorious summer. Anyway, out of the 6 runners for Cheshire, I managed to break into the top 4 counters which would go towards us scoring. That was all i wanted to do, make sure I wasn’t last home, and make sure I got a counter. I loved the experience, but I said yes thinking i would get a free race entry and free Cheshire vest, I was wrong, I paid for the entry, and paid for the vest. I have since found out the fell lads got the vest for free and race entry….whats going on, I need to change over to Felsby no doubt. Anyway we came 3rd, out of 3 counties ha ha, coming in behind Staffs and North Wales, with some really strong runners at the top end of the list, the Cheshire ladies however had a great run and came first, so well done to them. Also well done to Peter, Ian, John and Karen, full results below. Please find the consolidated parkrun results below. Well done to all the Green Army members who took part in one. That’s all this week folks, thanks again for all the fab reports, please keep them coming – helsby-race-reports@outlook.com.